In October, 1943, the WAVES debuted new Mainbocher-designed uniforms, to be used in summer and at warm weather locales. 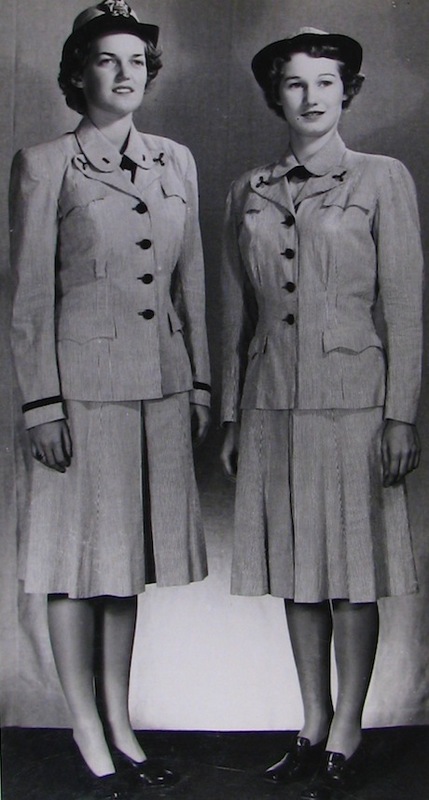 Above, WAVE officer Mary C. Broughton (left) and yeoman Marion Pearson (right) model the new seersucker uniforms. Broughton posed solo as well (left). The only difference between her officer uniform and that of the enlisted women is the officer’s hat, the band on the sleeve of the jacket, and the bar on the collar of her dress. On yeoman Pearson’s uniform (below), her hat has a removable cover that matches the seesucker of the dress. ← Thanks for Coming to the Screening!